The battle of the Somme was proceeded by a full week of artillery fire, constantly raining down shells on the German lines. What were they hoping to do with this fire? How were they planning to do it? These are the types of questions we will answer over the next several minutes before we dive into how the bombardment actually went after it got going. For both the British and the Germans the last week of June would be a very long one, for different reasons, and the results of this week are critical to understand before we can look into what happened when the infantry went forward. Last episode we talked about the British plan for the coming attack, and a big piece of the plan revolved around the guns. I am not referring to wimpy rifles, or pistols, or even machine guns, I mean the REAL guns that ruled the first world war battlefield, the artillery. That is pretty much all we are going to talk about today. The battle of the Somme was proceeded by a full week of artillery fire, constantly raining down shells on the German lines. What were they hoping to do with this fire? How were they planning to do it? These are the types of questions we will answer over the next several minutes before we dive into how the bombardment actually went after it got going. For both the British and the Germans the last week of June would be a very long one, for different reasons, and the results of this week are critical to understand before we can look into what happened when the infantry went forward. We start, with the numbers, the British and French would have under their command a total of just about 3,000 guns. This meant that for the British they had a gun for every 20 yards of front, and a heavy howitzer for every 58 yards. Second Lieutenant Cleeve of the Royal Garrison Artillery would speak about how the British got to some of these numbers "But they were improvised howitzers, because they were old 6-inch Mark Is, cut in half and the front half was thrown away. The rest was bored out to 8-inch with rifling and they were given modern breech mechanisms. They were mounted on enormous commercial tractor wheels as they were available. They were monstrous things and extremely heavy, but the machinery of the guns was very simple and that’s why they did so extremely well and didn’t give nearly as much trouble as some of the more complicated guns that came to appear later on. One was the very first one to be made and it was marked, ‘Eight-inch Howitzer No. 1 Mark I’ so we called that gun, ‘The Original’. It was marvellously accurate." I like this quote because it shows how held together by duct tape and bailing wire the British army was at this point, sure they had a lot of shells, and they would be bringing forward almost 3 million of them, but getting the other resources together was putting a serious strain on the British army. They were still suffering from serious growing pains, even if they were able to mount the coming bombardment. The artillery was also very green, for example a good portion of the artillery for the 34th division had a grand total of 3 days of practice with their guns in England before heading to France, where they did not have much more time before the coming attack. This lack of training, and supply difficulties which we will discuss near the end of this episode, would cause serious problems that would not be readily apparent until after the fact. One more bit, and this probably downplays this bombardment a bit, but the artillery on the Somme, while huge compared to 1914, was miniscule when compared to the largest bombardments during the war, later battles would see the same number of shells that were fired in a week on the Somme fired in a few days. That is just something to keep in mind when we consider the results of the bombardment, it was bigger than before, but not yet big enough. The initial plan was for the artillery to fire for several days, 5 days initially, and they were planning to use up a good portion of those 3 million shells during this effort. The field guns had taken up their positions 1000 yards behind the front and the heavy guns were dispersed behind. The plan was for the light guns to focus on cutting the wire, 1000 guns in total were dedicated to this task, and 1 million out of the planned 1.6 million shells were at their disposal. Even with this amount of focus, some fo the commanders at the front were concerned that it would not be enough. Cutting the wire was absolutely critical, and in reality, as they would soon learn, nothing else really mattered. While the field guns were focusing on the wire the larger guns would focus on hitting the trenches, strong points, and counter battery fire. They had a hell of a job in front of them when it came to trenches and strong points because there was something like 150,000 yards of German defenses that they had to try and deal with. The final job of the artillery was counter battery fire. They outnumbered the Germans guns massively but counter battery fire was still critical. The problem was, and the reason I left this task to discuss last, was because many of the commanders also just used whatever was left over for counter battery fire. The problem was that only the heaviest of the guns and the howitzers had the range necessary to hit the German guns, and unfortunately these very same guns were also the best at all of the other jobs that the artillery had to do. Because of this many commanders were forced to make a choice, and on the northern end of the attack many of them chose to greatly de-emphasize counter battery fire in favor of using those shells and guns for other purposes. On the southern end and on the French area of the front counter battery fire was given more priority, and in case you are wondering why I put so much focus on this aspect, yes, we will be coming back to this topic soon. While the planning for 5 day bombardment was an involved process, it paled in comparison to trying to plan for what would happen with the artillery when the attack started. Bombarding static positions was nothing more than pointing your gun at a thing, and then dropping enough shells on that thing until it was destroyed, however once the infantry went forward everything changed. Throughout the entire planning process for the artillery and for the attack in general a ton of thought was given to how to make the artillery as useful as possible for the infantry. The general direction from Rawlinson, as he said in his tactical notes to his commanders was that "the ideal is for the artillery to keep their fire immediately in front of the infantry as the latter advances, battering down all opposition with a hurricane of projectiles." This would be achieved by a series of carefully planned and coordinated lifts as the artillery slowly extended its range to stay ahead of the attack. All of this was practiced and planned behind the lines, however, when it came time for exact planning it would be left up to the divisional and corps commanders. They were given freedom to choose what their artillery focused on, how quickly it moved forward, and what precisely it was bombarding when. A good portion of the reasoning for this seems to be because each area of the front had different considerations and different situations, and this is sound, but what it really did was end up making each area of the front different, sometimes in a good way, sometimes in a bad. 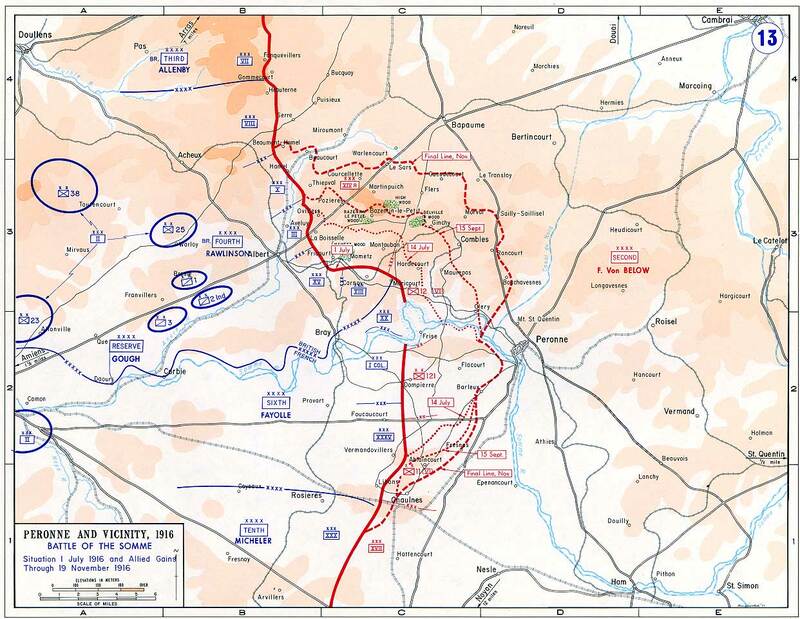 In many areas it meant that the fire would lift as soon as the attack started, and not a nice small lift to the next set of German positions but all the way to the next entire set of lines hundreds if not thousands of yards behind the first objectives. Now, if everything went perfectly, this was exactly the right move because it would have prepared the next set of lines for the arrival of British troops, but they had to get there, which is where it all fell apart. There was a smoke screen planned, that could have made up for this larger lift, but it had to be cancelled right before the attack due to inclement weather. These problems were not known during the planning though, and there were huge expectations put on the bombardment, that in reality it had no chance of fulfilling. One British officer would tell his men that "You will be able to go over the top with a walking stick, you will not need rifles. When you get to Thiepval [a village that was one of the first day’s objectives] you will find the Germans all dead. Not even a rat will have survived." Some of that can be chalked up to front line propaganda, no officer is going to tell his men before an attack that the artillery support is going to be worthless, but this optimism went from the lowest officer right up to Haig, they all expected good things. This results, would be disappointing. The barrage would begin on June 24th at 5AM, Midsummer's Day, or at least one source told me that, nobody else mentioned it, but it does have a nice ring to it so I have chosen to not fact check that bit. All along the front guns began to fire, and here is John Keegan from his book The First World War to discuss it "at 5.00 am, a storm of artillery broke with a crash along the entire line. As far as the eye could see clouds of shrapnel filled the sky, like dust blown on the wind. The bursts were constantly renewed and toil as it might, the morning breeze could not sweep the sky clear. All around there was howling, snarling and hissing. With a sharp ringing sound, the death-dealing shells burst, spewing their leaden fragments against our line. The balls fell like hail on the roofs of the half-destroyed villages, whistled through the branches of the still-green trees and beat down hard on the parched ground, whipping up small clouds of smoke and dust from the earth. Large calibre shells droned through the air like giant bumblebees, crashing, smashing and boring down into the earth." with all of the firing happening it was not long until some guns started to break down, as machines always do. Here is Lieutenant William Bloor of the Royal Field Artillery "At about 5.15 p.m. we had two ‘premature’ bursts. The first killed two of our infantry (17th King’s Liverpool Regiment) and the second hit Dod himself in the back. He was carried off to the dressing station at once and the Major went on by himself. After we had finished firing, I went up to the trenches and saw Dod. He has a shrapnel bullet through the kidneys and is for ‘Blighty’ at once. These prematures are the very devil but cannot be avoided. The barrel of the gun gets very hot with continuously firing, and this affects the charge of cordite and the shell sometimes bursts too soon. But it is a thousand pities and an extraordinary mischance that we ourselves should shoot an officer of ‘ours’" The initial plan, as a mentioned was for the bombardment to last only 5 days, so this would have made it end on the 29th, however, on the 26th it clouded over and began to rain. This had a few very important effects. First of all, it made the bombardment less productive because it slowed everything down due to transportation difficulties, it also meant that the Royal Flying Corps could not properly spot and adjust the British fire. They also could not report back estimates on the effectiveness of the fire. Because of the weather the bombardment was extended by 48 hours, pushing the start of the attack back to July 1st. This meant that the guns had to continue to fire, and the infantry had to continue to wait, for another two days. Captain Charles Manson of the Manchester Regiment, 91st Brigade, 7th Division would say that "We were all ready and anxious to get away, to get up and moving and done with the waiting. Waiting is rotten. I think it tries the nerves more than the actual moment of assault. " One of the huge advantages of having the massive amount of really detailed sources that I have access to for the Somme is that it is very easy to get a lot of great first hand accounts. This is not always possible, simply because I do not have the research time available, stupid real jobs. However, with so many books focusing almost exclusively on first hand accounts there will be a few times throughout these Somme episodes where I am just going to through a bunch of really good quotes from the various men who were at the front. This just so happens to be the first of these opportunities. The artillery bombardment occupies a large place in the British accounts of the battle. For the artillery it was because this was their moment to shine and their most important time in the battle and for the infantry, well they were just sort of hanging around and waiting. This gave both of these groups an incentive to write about their experiences one out of boredom and one out of importance. For the artillery, they felt like they were finally getting down to business. Here is Lieutenant Kenneth Page of the Royal Field Artillery "I was in charge of a section of an 18-pounder battery and we were given the job of cutting lanes through the German wire. It wasn't an easy thing to do You had to do it very slowly and very deliberately. The experts, the 18-pounder battery commanders, were quite good at cutting wire, but it did need very careful laying because guns were rather inaccurate things in those days. It wasn't easy to go plugging one gun into the same hole every time, however accurately you laid it. With the inaccuracies of ammunition and fuzes and even the guns themselves, you would get unavoidable errors." 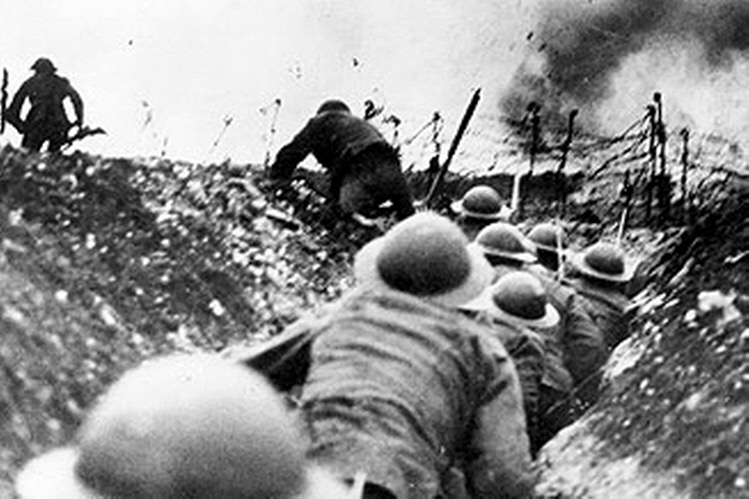 In the line the first feeling that most men had was simply awe, as Private Albert Atkins of the 56th Division explains "Imagine yourself, standing in a trench with water well over your knees, crouching against the side of the muddy trench, while thousands of unseen shells come shrieking and whining overhead and most of them dropping with a crash on the parapet or parados, followed by a terrific explosion which temporarily blinds, deafens and strikes one dumb. Even if you are lucky enough to miss being hit by one of the thousands of pieces of red-hot shrapnel, the concussion is sufficient to knock you over. Imagine yourself, being slowly buried by the displaced earth which falls down on you like rain and half drowned by the water in the trench; and while in this predicament, the shells continue to rush over." However, as the bombardment continued the first feelings of boredom started to set in, as Private Ralph Miller of the 48th Division describes "We got so fed up – to the point that we thought, ‘The quicker the bloody whistles go for us to go over the top the better!’ We always said to one another, ‘Well, it’s a two to one chance that we either get bowled over or get wounded and go home’. One of the two – that’s all we used to bother. We got so browned off with the waiting, the weather, you can’t really explain what it was like. Doing your bit and hoping for the best." As the waiting continued another feeling began to creep in, the weight of what was about to happen, as a signaller for the artillery describes when talking about the infantry surrounding him in the front line "Some were writing letters – perhaps their last – home; others were conversing in subdued tones; some were making a brave attempt at ribaldry. The anxiety, though brave attempts were made to hide it, was clearly discernable on the faces of those seated in silent contemplation of tomorrow and the pathos of it all overwhelmed me and I found it hard to disguise my emotions." Some men tried to keep spirits up, both for themselves and for the men around them as Private James Tansley of the 23rd Division did "We knew that quite a lot of us would be casualties on the morrow, we knew what was going to happen and it was interesting to see the different responses of the different soldiers. One man he would go away on his own, communicate with himself somewhere and he seemed rather moody. I tried to cheer him up. Others again they put on a form of jollification. When the march started up there towards the line it was all happy and ‘Long way to Tipperary’ – biscuit tins being hammered – and all jollification like that to keep up the spirits." Some men also took time to describe their fears, as Captain Charles May of the 7th Division did when thinking about his young daughter back at home "The thought that we may be cut off from one another which is so terrible and that our babe may grow up without my knowing her and without her knowing me. It is difficult to face. And I know your life without me would be a dull blank. Yet you must never let it become wholly so. For to you will be left the greatest charge in all the world; the upbringing of our baby. God bless that child, she is the hope of life to me. My darling au revoir. It may well be that you will only have to read these lines as ones of passing interest. On the other hand, they may well be my last message to you. If they are, know through all your life that I loved you and baby with all my heart and soul, that you two sweet things were just all the world to me. I pray God I may do my duty, for I know, whatever that may entail, you would not have it otherwise." Unfortunately, Charles May would be killed on the 1st of July, one day after the above passage was written. As the hours ticked down, some men, well, I'll just let Second Lieutenant Jack Engall use his words "My dearest mother and father, I’m writing this letter the day before the most important moment of my life – a moment which I must admit I have never prayed for, like thousands of others have, but nevertheless a moment, which, now it has come, I would not back out for all the money in the world. The day has almost dawned when I shall really do my little bit in the cause of civilisation . Tomorrow morning I shall take my men – men whom I have got to love, and who, I think, have got to love me – over the top to do our bit in which the London Territorials have taken part as a whole unit." Lietuenant Engall would also be killed in action on July 1st. While the German soldiers were not having a good time, the question remains were all of these shells doing any good? Well, first of all, there was a problem, the shells were not as reliable as was hoped. Many of them completely failed to explode, the worst of these seem to have been the lower caliber shrapnel shells that were supposed to be the ones cutting the wire. The shells either did not explode at all or they exploded too late, doing a lot of damage to the ground but just sort of bouncing the wire around. That is not to say that the fire did not hurt the Germans or their positions, the casualty numbers were around 7,000 during the week long attack. The mental situation of the survivors was not very good either. By the last day of June there were unit reports with quotes like "All had just one hope: let the endless shelling finally stop and the enemy attack." Even on the northe end of the front, where the bombardment was the least effective, the trenches were still heavily damaged. 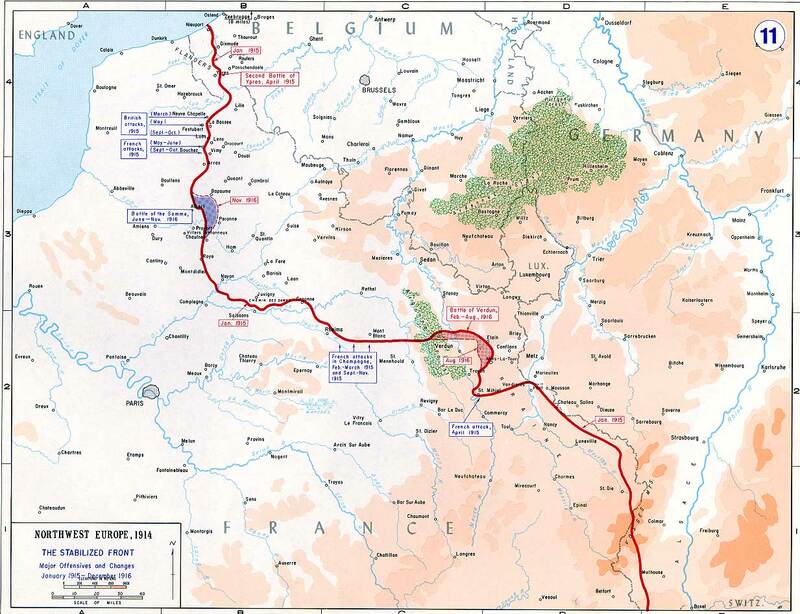 On the southern end, expecially on the French front, the bombardment had a serious effect on the German defenders both because of better preparation by the artillery and because the terrain was just worse for the defenders. Another problem for the Germans was that when the firing started most of their command centers behind the front were included in the firing zone which caused confusion on the German side while they were repositioned. Unfortunately for the attackers, most of this would be sorted out in the week before the attack. The Germans did not know exactly when the bombardment would end, and this limited their ability to prepare for what would come after. Prisoners that had been taken before the bombardment started correctly reported that it was planned to last 5 days, but after it started it was difficult to capture more troops. This made it impossible to know that it had been expanded for another two days. So after 5 days had come and gone the Germans were very much in the dark. Overall though, even though the Germans were knocked around a bit and perhaps a bit confused, almost all of the strongest German positions were mostly unharmed, most of the infantry shelters had survived, and the line was very much still defensible and still very capable. On July 1st at 6:35AM, the guns, which had been consistently firing for a week upped their speed to a crescendo. The Germans, sensing that this was the moment, fired red flares all along the line and telephone lines to the rear exploded with calls for the Germans guns to open up. Now the British troops began to get a taste of their own medicine as the German guns finfally answered the British bombardment with everything they had. This hit the waiting troops particularly hard because they were stuffed in the forward trenches waiting to move forward. All along the lines officers were staring at their watches waiting for the time to come, it was time for the attack to begin…which we will discuss next episode as the disaster and triumph of July the 1st finally arrives. This episode, and the next three episodes after it will focus strictly on the events of July the 1st, making it I think the most covered day in the history of our podcast.